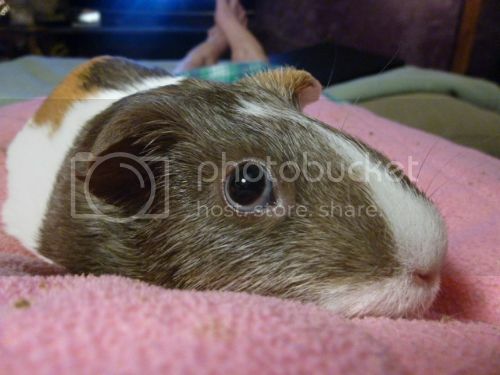 Isabelle is a pig I fostered and have now adopted. She was lopsided, and kept falling over. The original vet wanted to rule out any inner ear issues first, so she was on Baytril for about 3 weeks with no significant change. I think she's learning to adapt mostly. I'm totally in love with her. Here are some pictures, by way of introduction. I'll get a video of her walking and toppling over later today so I can get her opinions and feedback. Wow, she is a doll, jacqueline!! What a pretty girl! My Arnold had a stroke and couldn't walk for a few weeks. He was such a tough boy, learnt to walk again. He managed to get around okay, so hopefully she can improve too! Thanks folks! I'll get a video posted soon. I believe she's about 2. I'm working on getting more of her history. She's an intact female. Izzy walks, mostly close to the edge, though occasionally will walk across an open space. If she's startled or tries to run away, she will fall over. The other day, one of her cage mates nudged her (it looked intentional to me) and tipped her over (the guinea pig version of cow tipping?). Once she falls on her side, she struggles quite a bit to get up (it's actually a little funny). When I pick her up she definitely curls herself to the left, almost like the letter "C". When she leans, or falls, it always appears to be towards the left side. This doesn't appear to be head tilt, though you never know. As I said, she's been treated for ear infections. We're scheduled to take her to the vet next week, so I'll keep everyone posted. But if you have any thoughts for now, feel free to share. No helpful advice - but hoping you can get to the bottom of this! Does one or more of her eyes "roll"? My vet did some acupuncture treatments on one of my "rolly" pigs. I can't remember if it helped. Interesting. Isabelle's right eye doesn't roll, but looks a little like "pea eye". Does it look different than the other eye? Have you had any X-rays done? I'm in the process of trying to reconstruct her medical history. She's been at two rescue homes, and now mine - at least. 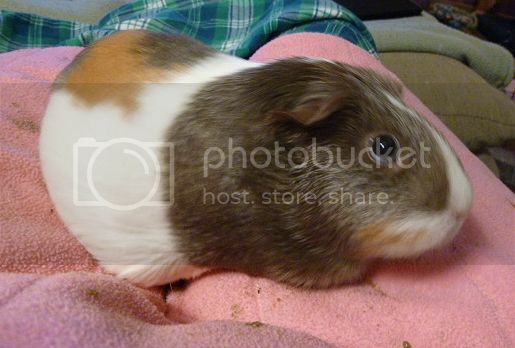 I'm surprised at how often medical info (not to mention social history) doesn't come along with a piggie. She did have xrays taken, with no indication of any problems. if you look at the above photo, you'll see her left eye. It does look a little "pop" eyed, and there's that layer of - what? extra lid? - underneath. I'm eager to see what Dr. M. thinks. I was going to point out that her right eye looks a bit abnormal to me. It looks a bit like Lolly's eye here; slightly protruding and somewhat distant and not really in focus, and the vet thinks she has a mass behind it which is pushing it outward. Sadly interesting. Isabelle's last vet listed possible bran tumor as the cause for her neuro condition. I hope not. . .
Let us know what Dr. M. says. Sorry for not updating sooner. Dr. Mickley took look at Izzy and believes her condition is either the result of an injury or some sort of neurological event. Either way, there’s nothing to do at this point except monitor her. Isabelle’s been doing okay. She and blossom have become very good friends. She’s put on some weight (a lot) so, that’s good. Here’s where I could use the GL mind. I’ve attached a YouTube video of Isabelle. I took this at dinner time. It’s terribly painful for me to watch, but I couldn’t have asked for a better video of exactly what happens with her. I have tried not to intervene with her when she topples. I’m not always home, and she needs to be able to get herself upright by herself. I do have to rethink the cage environment again I think. I need to remove the fleece tent since she could get caught in it. I also have to be very careful to keep the ground level. Any lump or bump is a potential for her to topple. Also, this afternoon she was in a free standing hidey, moving around inside, and the whole hidey rolled over, with her in it, with the opening down. I’m not sure she could have gotten out of that alone. I need to secure all the hideys and prevent them from moving. Here’s where I need help. I can’t detect any muscle weakness or problems actually moving her legs or hips. I just wonder if something like the roxy roller would her to keep her in an upright and stable position. I’m not sure any device would be temporary, leading to her strengthening something, but I’m looking at perhaps rigging something to give her more stability and prevent her from toppling. By the way, Isabelle had just had a min-bath, so it's her trying to shake off after her bath and blow dry that triggers this topple. Bless her heart, it is painful to watch. I wonder if there were things in the cage that she could push against when she turns over if it would help? Maybe bricks placed around the open areas? Does she seem to be learning to turn herself over at all, or is it as bad as when you got her? Mostly, when she walks through open spaces, she crouches low to the ground. other times she will walk close to the edges. I'm of 2 minds here (at least). I was hoping giving her open space would help her gain confidence and get better balanced. I was also hoping that she'd learn how to right herself better. Neither seems to be happening. Should I create a semi separate safe room for her? I take a small corner of the cage (about the size of a 1x1 c&c) and put soft bumpers on the side. I could place the food, water and hay in such a way that she could get to them by walking along the sides. 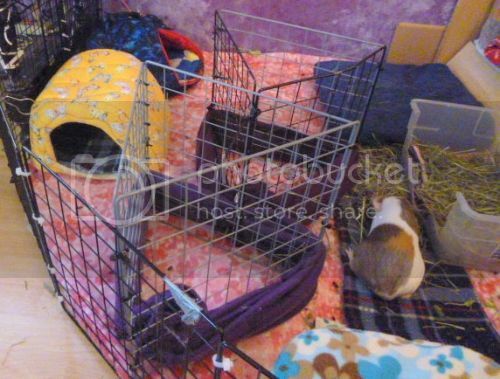 She could go out into the larger space if she wanted, and Blossom could come into the smaller space as well. I guess the real question is should I try for rehab or accommodation? It seems to me we had a guinea pig with a similar problem. 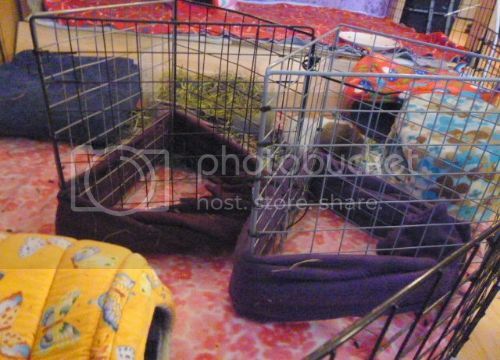 I vaguely remember the guinea pig using the sides of the cage to navagate - but I remember so little! "I guess the real question is should I try for rehab or accommodation?" IMHO only -- accommodation. The semi-separate safe room, with access in and out, soft bumpers on the side and hay, food and water inside, sounds like a great idea to me. Ideally Blossom could learn to help her right herself, but I'm not sure that's something that could be taught. If it were to spontaneously happen, though, that'd be great. Hmmm. . .I'll have to work on that semi-separate area. The wheels are turning. . . I'm so sorry she's having problems. She's just adorable. Here's my initial attempt to set something up for her. I ruled a number of other things out. It had to be stable enough so that if she fell against it, it would stand, and also soft enough for her not to get hurt, but hard enough for her to lean against and get up.